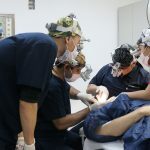 Dr. Carlos Calixto from Brazil, visited our hair transplant training center for a 3 day training program (FUE Course) and expanded his skills in the fue hair transplant technology. Dr. Carlos Calixto is a well know surgeon in brazil. Dr. Carlos Calixto a prevalent plastic surgeon from Brazil, has more then 30 years of experience in his field. He was also the President of the Brazilian Society of Plastic Surgery from 2005 – 2007 and from 2010 – 2011. Dr. Carlos Calixto offering since several years fue. 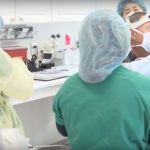 Dr. Calixto learned about manual fue extraction as well as the use of fue with motorized extraction tools . Dr. Calixto was also teached to use the pcid from Coleinstruments, the most suitable punch, how to extract body grafts, check of the transection rate, handle of follicular unit`s (grafts) and to use the most suitable magnifications and loupes. In the past Dr. Calixto used different motorized fue extraction tools. He finds that the PCID is superior to other devices and that as example the pcid is very easy to handle (lightweight). Also the device does not develop heat and also has a very good size.